It is March and soon it will be time to get outside and shake the dust off. Do not underestimate the power of your smart phone to get you moving. Companies and fitness instructors have teamed up to create some very compelling content to get you off your tush. This is one feature of smart phones that you can celebrate! I asked Snack Girl readers about their favorite fitness apps in my weekly newsletter and I was so excited to learn about more options. Some of these have free versions and all have free trial periods so you can see if you can get hooked. It is a great thing to get hooked on an exercise app versus something like Candy Crush. My current favorite is called Aaptiv and it costs $14 per month (which I know is a lot) and is on Android and Apple phones. Aaptiv offers unlimited access to 100s of classes in outdoor walking and running, indoor cycling, elliptical, treadmill, stairclimber, rowing, strength training, stretching, meditation and yoga (with 150+ new classes each month). Do you see how someone who gets bored easily would like this app? 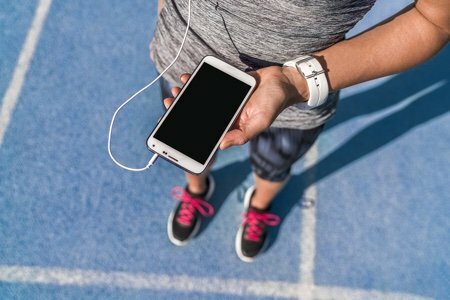 I have done walking, running, and stretching and the best part is I can choose my workout, time to spend, and the workout features an inspiring trainer and wonderful music. I am a fan as are many Snack Girl readers. I had never, ever heard of this and I must say it intrigues me. I find running to be great exercise but so boring. Dull. Argh. I’m a bit embarrassed to admit this, but I love the “Zombies, Run” app. I started with the free version (which I think limits you to one story run per week) and then forked over some cash for full access. This is an extremely creative and clever app which gives you stories mixed together with your own music. You can turn on/off “zombie chases”, which ask you to speed up to outrun a fast gaining zombie for a short period of time. The app nicely tracks mileage/times, but mostly it keeps my mind off the fact that I am running. They also have periodic virtual races, which you do on your own schedule. I did their Halloween 5k last fall, and though I was apprehensive about how well it would work, I enjoyed it (and the pre-race mission stories) and managed to push myself harder than just a regular run. You can pause and resume each “mission” over multiple runs if needed (they are typically 30-40 minutes), but I usually want to hear the end of the story and just keep running (or walking for a cooldown) until the story is done ☺. Doesn’t that sound like fun? I want to RUN from Zombies today!! Looking for a Short Meaningful Workout? Who isn’t looking for a workout that can be done in a few minutes and still help you stay fit? This seven minute workout is a great one for getting you going and feeling great all day. I have done versions of this and love it! Right now I have been using the 7M Workout . It's good because I can say to myself, "7 minutes-Come ON, you can deal with that!!". They also have 8 and 9 minute ones and you can repeat them and choose beginner options (me) and have the option to add on a warm up or cool down. Yoga, Fitness, Meditation, and Cooking!! Grokker is a pretty cool app that helps you by having longer term programs for different goals. I love the class format and the personal interaction. You can post questions and their fitness instructors will respond. It offers all types of workouts, yoga, Pilates, meditation, and cooking - although the two of us would not agree that every recipe is "health." Additionally, you can get a personal workout program - all of which is included in their month fee of $15. Thank you, everyone, for sharing your favorite apps. Please share what is working for you in in the comment section. I too like to exercise at home. Been doing so for years. In the last year I came across an app called Hasfit. It's a husband & wife team and they are just awesome. Its free but you could donate (which I do). They have all programs from beginners to advanced. I guarantee you'll love them! I have used MyFitnessPal free since 2011. You can track your food and workouts. You also track your progress (weight, measurements) and there's charts for those features. It's free and is a great sense of community. I use both the app and the website. I second MyFitnessPal - it is a great app. They also send me emails every day with very interesting articles and motivation. I use Map My Ride which tracks right into MyFitnessPal! It not only does gps tracking, one may also manually enter multiple types of exercise too! I've been using it a few years and like it! I use MyFitnessPal with my FitBit Zip that is always on my belt. I love walking outdoors, do malls if bad weather. But I hate jogging, running, machines. But I have the time and it’s true: walking is the best medicine!